New water pipe, inside plastic sheath, being lifted into place on Powers Avenue. This, as you have no doubt noticed, is the road-construction season. Let us take the occasion not to fume about the inevitable traffic delays but to acknowledge the remarkable degree of planning, coordination and execution on the part of the crews that these jobs require. Just now the roundabout on Albany’s Main Street is beginning to take shape. The preparation, though, has been going on for weeks. In Benton County the gas company is doing another huge pipeline job. Many other state, county and local projects are under way all over the mid-valley. The pipe section is ready to be lowered into place. 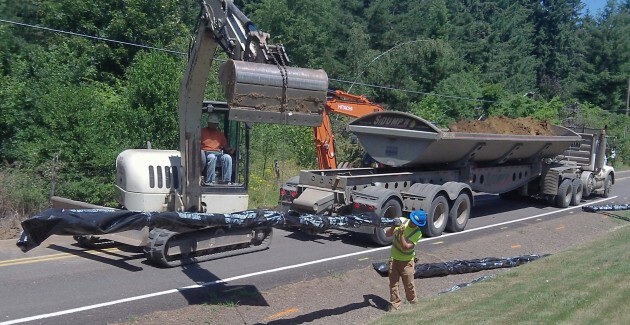 In my neighborhood, Pacific Excavation of Eugene has been working since Monday on laying a new water line on Powers Avenue. It is a joy to see a well coordinated crew with the right heavy equipment getting the job done smoothly and quickly, even though residents occasionally insist on driving through the construction zone. 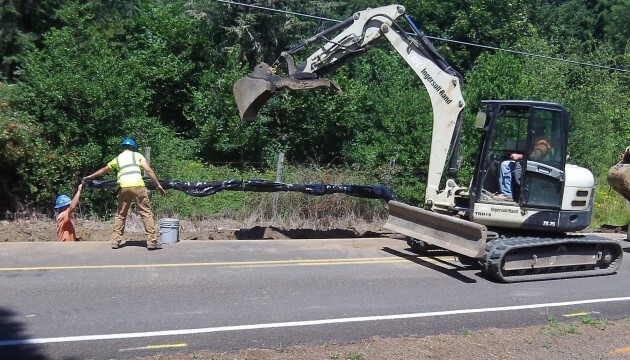 Sections of the new pipe have been prepositioned on one side of the road, the side where the old water line is going to be abandoned. A huge excavator carves a precise, squared-off ditch on the other side and loads the dirt on a dump trucks waiting in line. As soon as the ditch is ready and the excavator has moved a few yards, a machine lifts and men guide the new pipe sections into place and connect them. A truck with a long trailer full of gravel arrives, tilts the trailer sideways and dumps the material to close the ditch. Another machine tamps it firm, and a water truck sprays the road to wash the dirt away and keep the dust down. In the course of half a day, the crew has laid new pipe over several hundred yards. We rarely think of the work that goes into an item as mundane and but essential as a water line. It’s called “infrastructure” for a season: It’s below the surface and out of sight. So it’s good to get an chance now and then to see how this kind of installation is done, and to appreciate the skill on display when it’s done well. Good words Hasso. And people should remember that this work is funded by their water and sewer payments, gas taxes, payments for natural gas and the like. Nothing is “free” in this world. On these projects people should also remember that while the multi-million dollar cost is often paid through their government (or closely regulated utility), the work is mostly done by private sector contractors who publically bid for the work. City/utility crews mostly only do ongoing maintenance work and emergency repairs. The reason is that local crews can respond quickly and efficiently when a private contractor with the needed skills/equipment may be hours or even days away. Some folks have argued that this type of “on call” work can be contracted out. But the reality is that it is expensive for a private sector company to maintain the staffing and equipment for a broad range of activities. A great many contractors specialize in certain activities, and they are often hired for their expertise. The bottom line is that there is no single “right way” to manage. A complex web of factors can make something work well in one community, but work poorly in another.